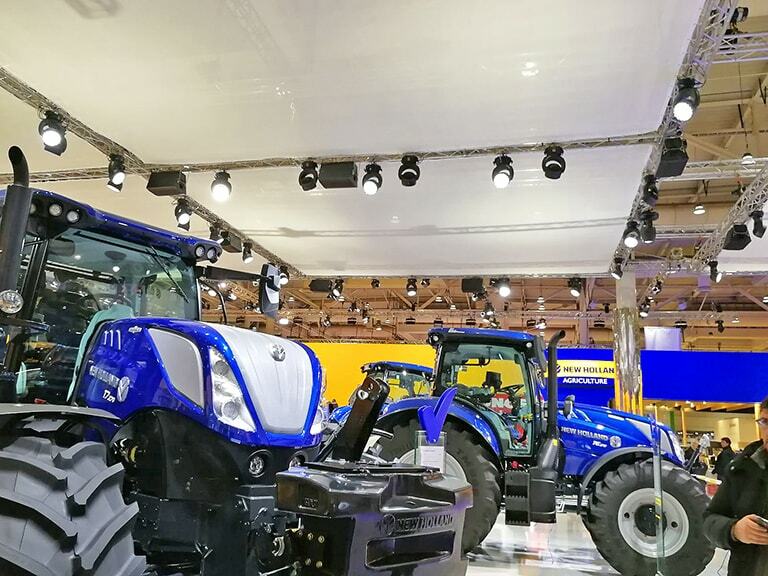 ‘Agritechnica 2017‘ – the most important international exhibition of agricultural mechanization – was held in Hanover from 12 to 18 November. 2,900 companies exhibited their products in the 23 pavilions of the fair complex. MMS – one of Italian largest rental companies specializing in exhibitions, conferences, major tours and television – set up the lighting system of the impressive stands of New Holland and FPT, two leading companies in the CNH group. MMS installed 378 DTS projectors, including 150 BRICK units. We thank Sergio Cattaneo, designer and LD of the installation, for this interview. 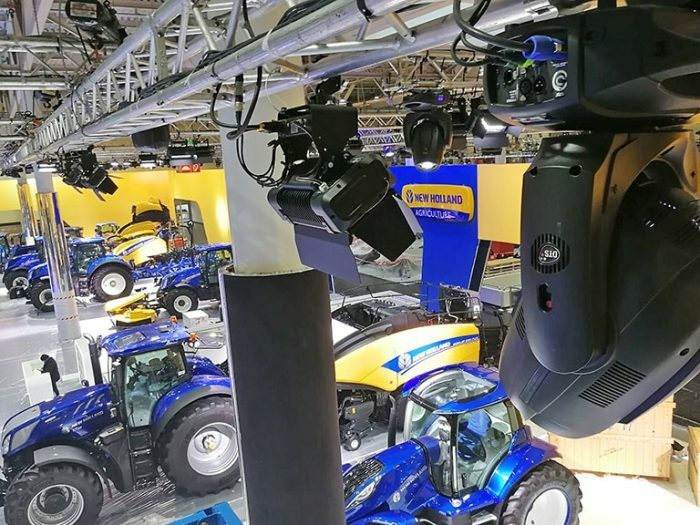 How was the ‘Agritechnica’ lighting project, and how did you use the DTS projectors? “As in many cases, after a meeting with the architecture studio, with the client, and a confrontation with the exhibition staff on permitted weights and non-suspension areas, I developed the project by designing structures and lights. 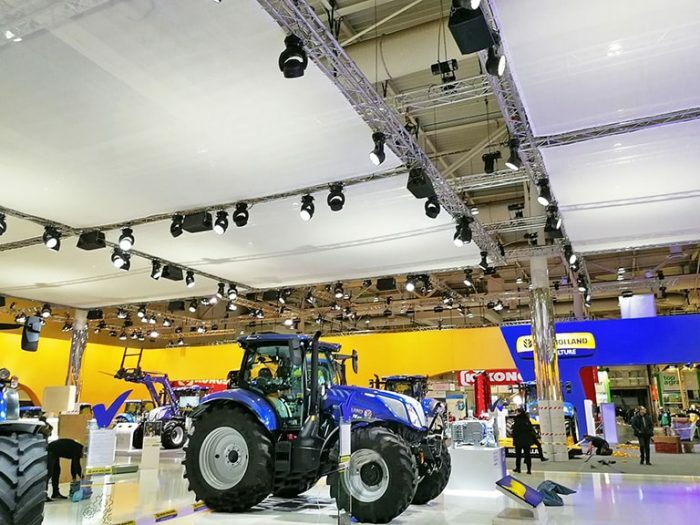 We installed 150 BRICKs, 148 Nick NRG 1201 units and 56 EVOs, all hanging from the trusses suspended over the large stand of New Holland company. In the FPT stand, instead, I installed the LED PROFILO 80 and SCENA LED 80 projectors on the electrified rails fixed directly on the stand structure. I like to give a precise purpose to every kind of projectors I use! I usually don’t ‘mix’ the various types. I used the BRICKs for lighting each vehicle; for this purpose, I found the CRI response very interesting, and also the precision of the CTC parameter. In fact, as there were either blue and yellow vehicles exhibited in the stand, it’s my habit to use distinct color temperatures to highlight them. In my opinion BRICK colors are well saturated and satisfactory, with a very good luminous output, especially if you take into account its weight, only 11 Kg. The modularity of the holographic filters of the BRICK is very effective. That’s really a good solution, because DTS met my special filter requirements, such as 12°, 16° and 15° x 30° asymmetric . This important installation of the BRICK in one of the world’s largest exhibitions follows the many successes in a variety of applications. The live concerts at the Arena di Verona, the architectural lighting of the Rome’s International Tennis Championship, the TV installations such as ‘X Factor’, show the extraordinary versatility of BRICK, the most flexible and effective solution for any lighting project.